Childhood obesity is a serious problem in the United States. According to the Centers for Disease Control and Prevention, 17 percent of children and adolescents ages 2-19 are obese. A 2010 report shows that children ages 8-18 spend an average of 7 hours a day in front of their screens. In the last few years, there have been modest decreases in obesity among young children, but there is still a lot of work to do. 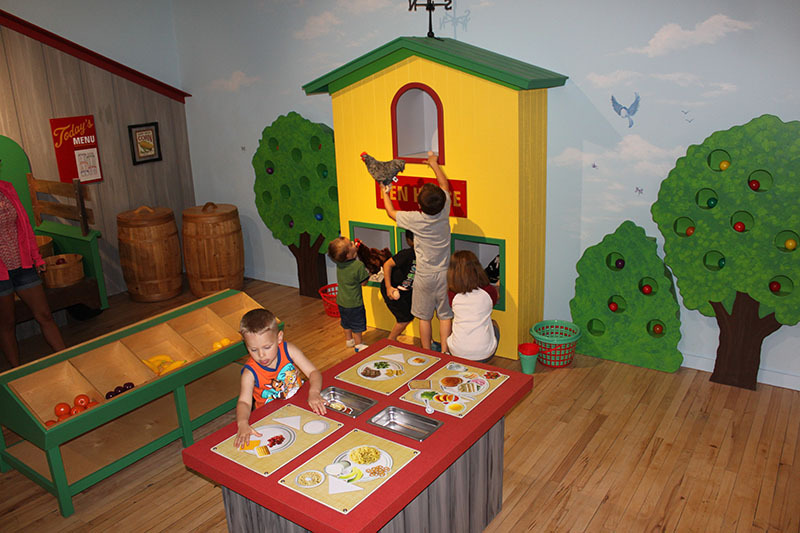 Museums have and continue to play a key role in educating children and their caretakers about nutrition and exercise through programs, interactive exhibits, outdoor spaces, and food service focused on healthy eating and increased physical activity. Over the past five years, IMLS has funded more than $3,500,000 for projects that provide museum and garden visitors with the opportunity to learn about healthy food choices and physical activity through interactive exhibits and programs. Tyler Arboretum in Media, Penn. The Tyler Arboretum received a Museums for America for Edible Garden, which uses hands-on gardening to connect visitors to the natural world. By sowing, growing, harvesting, and working with the soil, staff demonstrate how to nurture edibles, herbs, and flowers in organic and sustainable ways. Visitors discover how native plants, wildlife, pollinators, and people are partners in healthy gardens, supporting a food web that extends from the home garden to the table. Tyler Arboretum reaches over 9,000 schoolchildren a year, connecting them to nature through hands-on exploration. Programs are focused on healthy eating, healthy living, and cultivating healthy land. The garden helps “convert vegetable skeptics into vegetable lovers,” according to Executive Director Cricket Brien. Staff at Tyler Arboretum responded to concerns about community health when developing Edible Garden. Regionally, Delaware County has the highest rate of obesity in Southeastern Pennsylvania and a high incidence of chronic diseases related to unhealthy living, according to a nearby hospital assessment. Edible Garden addresses the need to educate the community about childhood obesity and the necessity for incorporating more fresh vegetables and fruits into daily diets, providing tools to enable families to become more self-sufficient by growing their own produce. Tyler Arboretum has also partnered with Delaware County Libraries. According to Brien, staff created vegetable demonstration gardens at five area libraries to “extend our message of healthy living and healthy eating to our shared community.” In addition to educating community members about healthier food choices, the arboretum is giving back to its community by donating fresh produce to local food banks in Media and Chester, Penn. The Children’s Museum of Oak Ridge, Tenn. The Children’s Museum of Oak Ridge received a Museums for America grant to plan, develop, and construct Kids in Action, a healthy living exhibit and accompanying educational programs to support healthy nutrition, healthy activity, STEM education, and community wellness. Kids in Action uses fun and engaging activities, including a human body exhibit and a fitness trail mascot, Peppy Pepper, to raise awareness in the community about healthy nutrition and exercise and to encourage positive attitudes concerning healthy lifestyles. Executive Director Beth Shea explained that Tennessee is one of the unhealthiest states in the nation, with high levels of childhood and adult obesity. She recounted a time at the grocery store when she overheard a conversation between another mother and daughter. The daughter, who was about 13 years old, asked her mom to buy a bag of fresh peaches. The mom declined, saying they were too expensive, and instead put a bag of potato chips in the cart. Photo by the Children’s Museum of Oak Ridge. Beth did not want to have to bear witness to additional grocery store conversations like these, and consequently, museum staff developed “Kids in Action! Healthy Living” to address childhood obesity by encouraging children to live healthy by making good food choices and through fun exercise. The exhibit opened a few months ago and has been reportedly very popular with preschool age children and their caregivers. The Children’s Museum has successfully partnered with community organizations, including the local and county health department, hospital, University of Tennessee Cooperative Extension Service, and 4-H. The museum also recently partnered with the Anderson County Health Department, targeting young mothers and their children to provide resources about health and nutrition. Madison Children’s Museum, Madison, Wisc. The Madison Children’s Museum received a Museums for America grant to develop Design to Move, a project encouraging increased physical activity by redesigning stairwells in its historic building and by producing related programming to counteract decreased activity and a rise in obesity among Wisconsin children. The museum will select local artists to create an artistic stairwell installation, facilitate community-generated artwork for a second stairwell, and develop programmatic incentives to motivate employees to use the stairs. Through a coordinated marketing campaign, the initiative will seek to increase public awareness of stair use and related health benefits. Less than half of Dane County youth report being active at recommended levels (60 minutes a day for 5 days a week). Twenty-three percent of Dane County youth are overweight and 9 percent are obese, according to the Dane County Youth Commission. These children are more likely to have high blood pressure and high cholesterol, increased risk for Type 2 Diabetes, asthma, joint problems, gall stones, and psychological problems, among others. These are just three examples of the many health and wellness related projects supported by IMLS. Museums can play an essential role in supporting the health of their communities, and the case studies above will hopefully inspire others to do the same. If your institution is thinking about developing a health and wellness-related project, consider applying to IMLS Museum for America grant to help support this important work. The next deadline is December 1, 2017. IMLS staff members Steve and Jill are more than happy to talk with you about your project ideas. Prepared by Jill Connors-Joyner and Steve Shwartzman. Jill Connors-Joyner is a Program Specialist in the Office of Museum Services. She helped manage the inaugural year of the Museums Empowered special initiative, and her work also focuses on the National Leadership Grants for Museums and the Museums for America program. She can be reached at [email protected].